I’m Jackie, the owner of Cakes & Drapes. 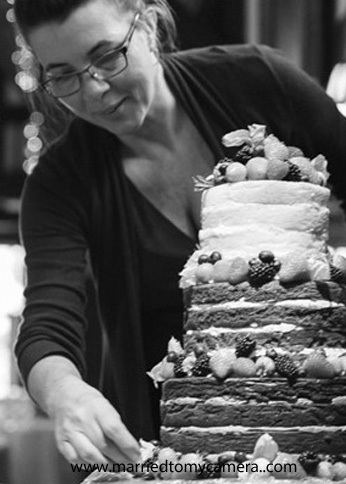 Working from my home in Walton-on Thames, I offer a bespoke cake-making service from personal consultation to delivery and set-up at your venue. My cakes are baked to order from the finest ingredients and decorated to exacting standards. My inspiration comes from you, your likes, dreams and passions. My mission is to turn those ideas into an innovative bespoke cake to fit any celebration. Many of my cakes are decorated with lifelike sugar flowers made to match your wedding flowers. Bespoke sugar models are a speciality, created to capture your individuality and provide a keepsake for the future. My designs often bring these together to create a timeless, elegant centrepiece that reflects your personality. I offer a reliable, friendly and professional service and pride myself, on the testament of many, that my cakes taste every bit as good as they look. All the cakes on my website are my own work so you can be safe in the knowledge that if you order a Cakes & Drapes design it will be of the same high standard. For full peace of mind Cakes & Drapes is fully registered and insured and holds a 5* hygiene rating. I feel privileged to have worked with many wonderful clients over the years, many of whom have become multiple repeat customers. For every order I thank you for choosing me to be a part of your special celebration.